YouTube has signed a deal with a San Francisco news station, ABC7 News (a.k.a. KGO-TV), that allows local citizen journalists to upload their own video reports and photos. The project is called uReport. Videos and photos can be uploaded directly through Google Maps or sent via email in four categories: breaking news, events, weather, and Bay Area scenes. This is not the first time that local news stations have solicited user-submitted videos, but it does mark the first time YouTube has been an official partner. 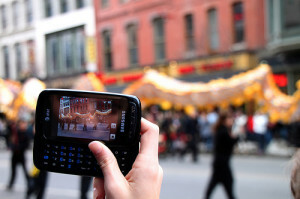 uReport builds upon YouTube’s citizen journalism concept, CitizenTube. What’s not working in your city? How long are those bathrooms at the park going to remain closed? Why can’t they stop my street from flooding every time it rains? Who’s responsible? Submit video of what’s broken in your community and we’ll try to get it fixed. ABC7 News will feature newsworthy videos on local TV, on its website (ureport.abc7news.com), and on its YouTube channel (youtube.com/abc7news). uReport utilizes the YouTube Direct technology that enables organizations to embed upload functionality of YouTube into their own websites, accepting video content from their own audience. For a list of YouTube-related apps for your mobile device, visit Google Mobile’s YouTube for Mobile page. Image by Mr. T in DC, used under its Creative Commons license.